After a back and forth pre-flop betting and raising war, Brian Bosworth is all in from early position and has been called by Matt Solitro in the big blind. The board runs out K♦5♣4♣7♥2♥, awarding Solitro the pot to take the chip lead, and eliminating Bosworth in 8th place. James McKinnon moved all in for around 10 big blinds holding A♥10♥ and was called by Matt Solitro holding A♦J♠. The board ran out K-9-2-3-K, eliminating McKinnon in 9th Place. 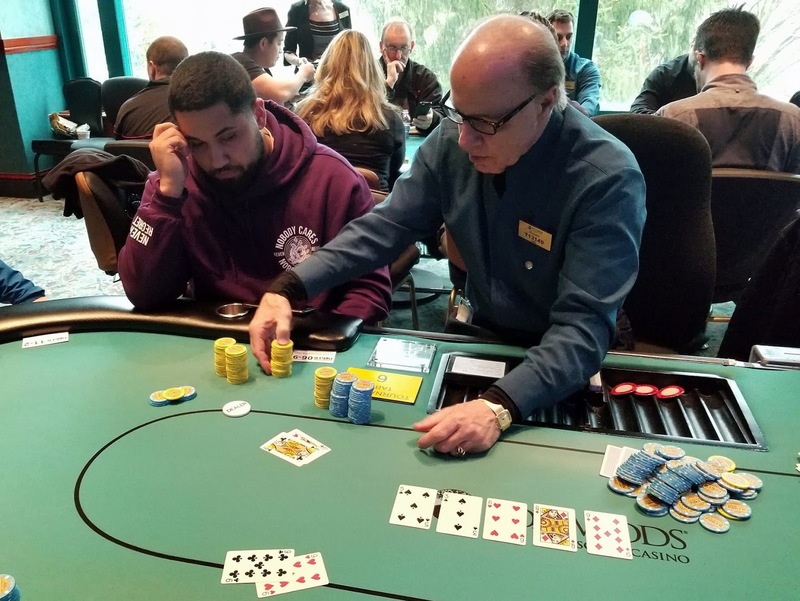 Solomon Yi moved all in holding K-Q, and was called by a player holding K-K. Yi flopped a queen but was unable to improve, and was eliminated in 10th place. There is around 1,500,000 in the middle, and the board reads 10♣5♦4♥Q♠4♠. 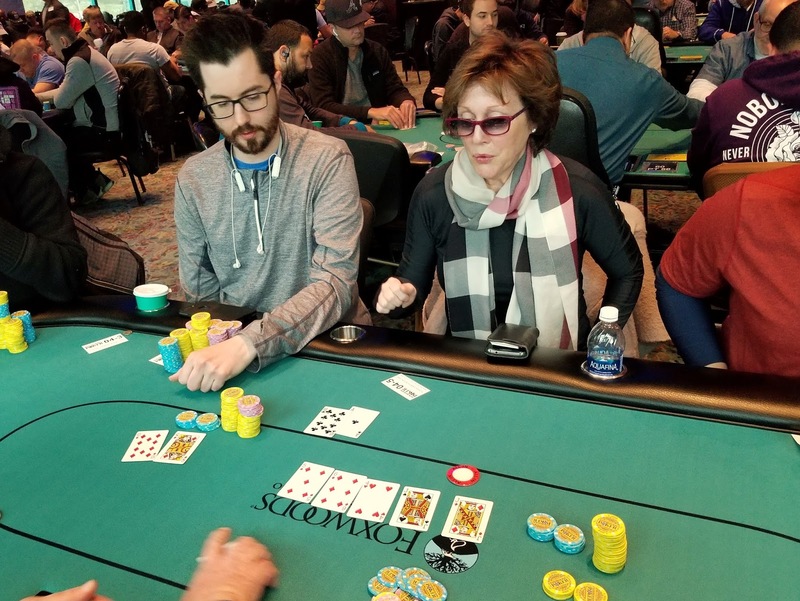 Margarete Stanchewski bets 500,000, and David Mock moves all in for around 650,000. "I guess I have to call," Stanchewski says as she moves chips forward. "Come on ten," Stanchewski says. "A ten wont help you," a player at the table not involved in the hand says to her. The river is the 4♠, and Mock doubles up. "That was a terrible flop," Stanchewski says as the chips are passed across the table. The final 28 players are now on a 60-minute dinner break. They will return to play Level 25, with 12,000/24,000 blinds, and a 5,000 ante. Play will resume around 7:00 pm. Patrick McConnell raises to 45,000 in middle position, and Lisa Calhoun re-raises to 100,000 in the small blind. McConnell moves all in for 274,000 total, and Calhoun take a few moments before calling. McConnell is ahead holding A♣K♠ against Calhoun's A♠7♠, but he only holds that lead until the flop comes 10♥7♥2♥, giving Calhoun a pair of sevens. 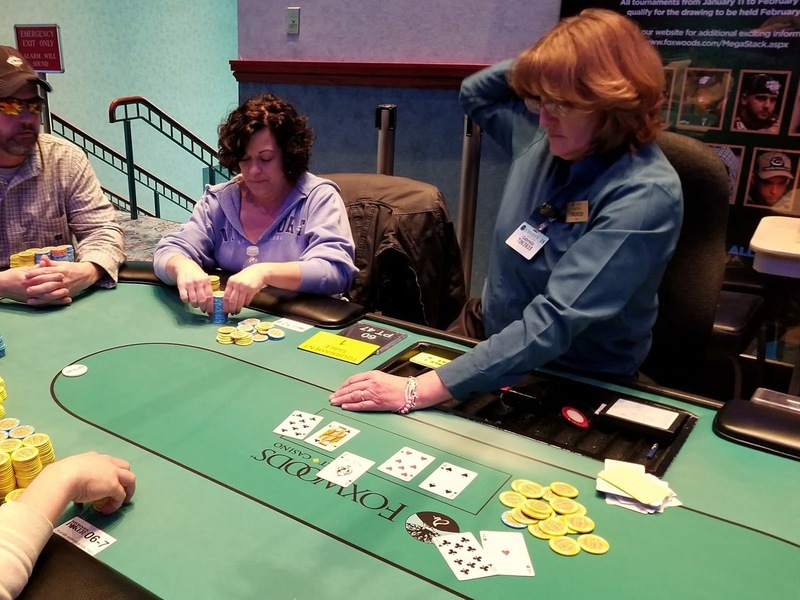 The K♣ on the turn gives McConnell back the lead after he turns a pair of kings. The 5♣ river is safe, and McConnell takes a deep breath as he sits back down in his chair. "Always a sweat until the river," McConnell says as the chips are passed over to him. Lisa Calhoun is all in from the big blind for 230,000, and has been called by Byung Seo on the button. The board runs out A♠7♥4♠J♣8♣ awarding Calhoun the pot to double up. There is around 300,000 in the middle, and two players to see the Q♦9♦6♥ flop. Facing a bet from Daniel Podheiser in the hijack, David Mock is all in for his remaining 310,000. Podheiser calls, and the players reveal their cards, both having flopped sets. The 3♠ turn, and 5♠ river do not change the outcome of the hand, and Mock doubles up. "Wow, those are probably the two biggest pots of the day so far," Podheiser says, referring to a recent pot he played to take the chip lead. "A re-distribution of wealth," another player remarks as the chips are passed over to Mock. According to a few players at the table, including both players involved in the hand, Dnaiel Podhesier recently took down a monster pot to be the first player to cross over the million chip mark, and take a monster lead in the remaining field of 50 players. According to the players, Gary Lucci limped in from early position, and Podheiser raised to 30,000 in the cutoff. Lucci called. The flop came 9♣8♥5♦, and Lucci checked. Podheiser bet 30,000, Lucci raised to 80,000, Podheiser made it 180,000, and Lucci smooth called. The turn was the 9♦, and again Lucci checked. Podheiser moved all in for around 390,000, and Lucci quickly called for slightly less. Fortunately for Podheiser, the 2♣ river was safe, and he doubled up, and was awarded the biggest pot of the tournament so far, while Gary Lucci was eliminated from play. After MANY doubles during the hand-for-hand portion of play, the bubble has just burst. There is around 30,000 in the middle, and the board reads A♦Q♣5♠Q♥5♦. 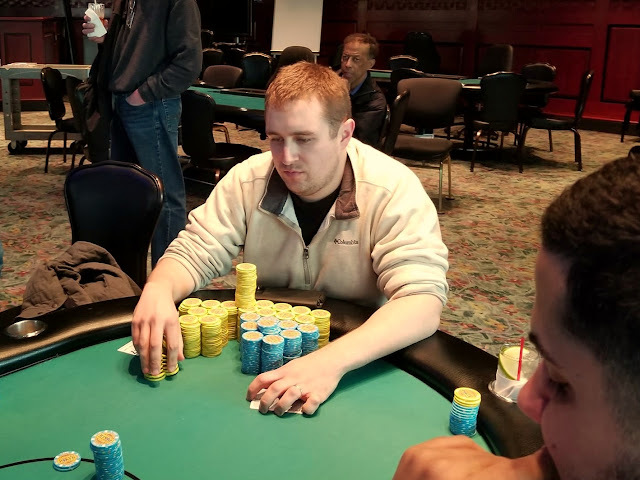 Daniel Podheiser bets 12,000, and the player on the button moves all in for 57,500. Podheiser thinks for a few moments before calling the all-in. Podhesier wins the hand with his two pair, aces and queens, and his opponent is eliminated from play on the bubble. 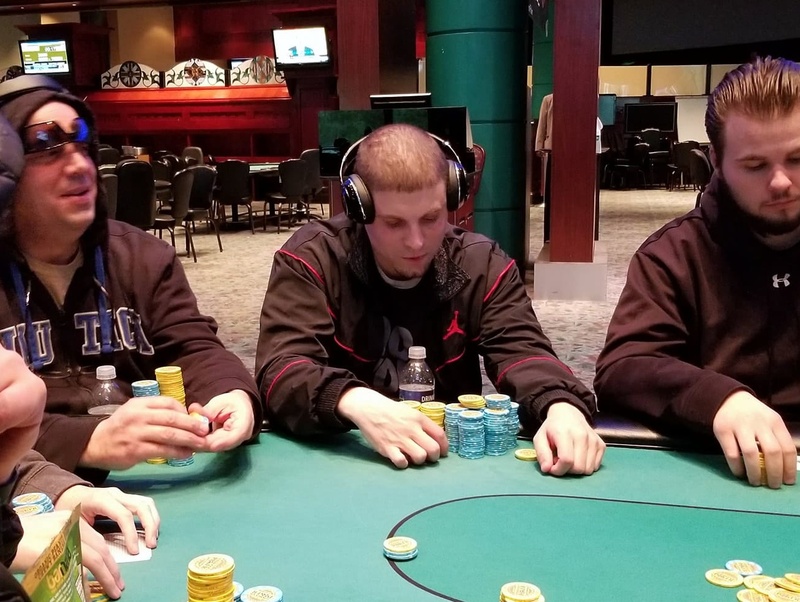 Facing a 15,000 raise from Marty Camara in middle position, Stephen Santoro moves all in for his 41,500 in chips from the cutoff. Camara calls. 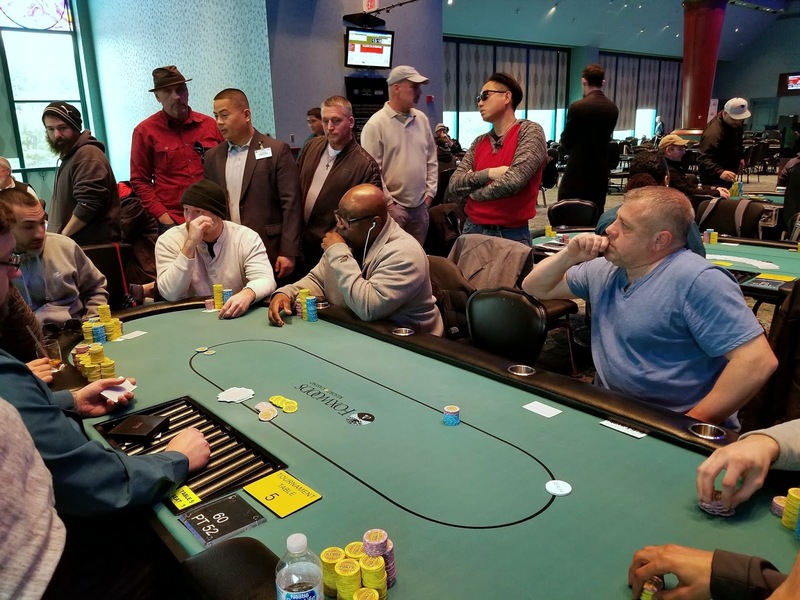 "You are not the person whose all-in I wanted to call," Camara says to Santoro, "Your'e the tightest player at the table, I am probably in trouble here." "Good luck," table mate Johanssy Joseph says to Santoro, "Would you take a chop?" "I would rather take a double, but I guess I would take a chop," Santoro says before the players table their cards. 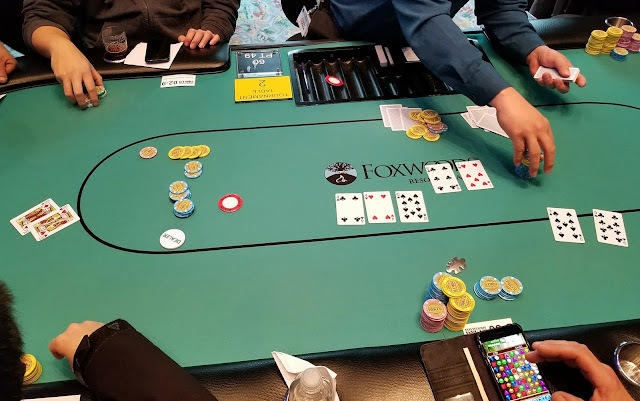 The flop comes 10♥5♦2♠ leaving Camara in the lead with his pair of jacks. The J♠ turn maintains Camara's lead, but also gives Santoro a gutshot straight draw. 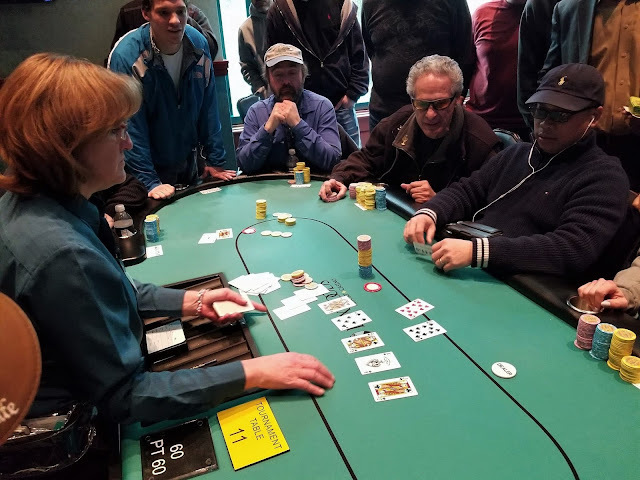 The Q♦ arrives on the river, giving Santoro the broadway straight to win the hand and double up, and a few players standing around the table cheer for Santoro having hit his perfect river card to double. 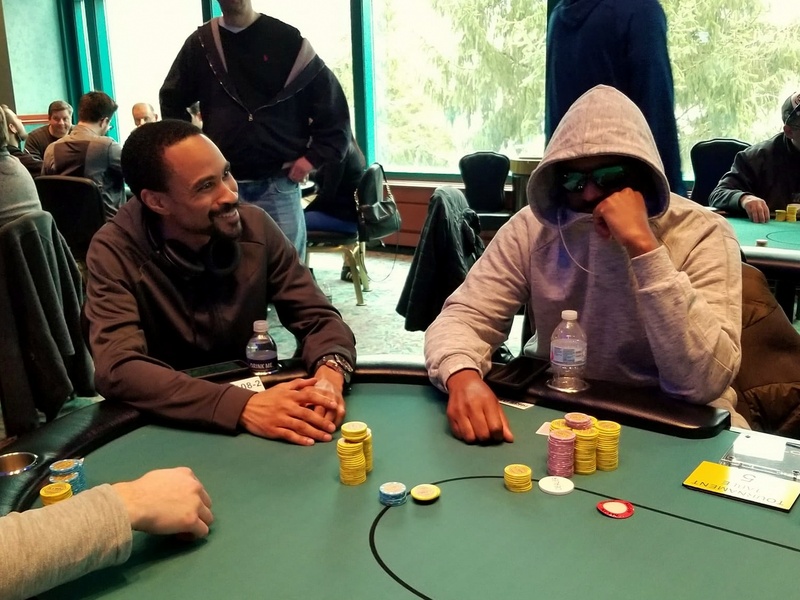 Facing a raise from Johanssy Joseph in the cutoff, Kareem Marshall moves all in for around 100,000 on the button, and Joseph quickly calls for his 80,000. The board runs out 10♣9♠7♣5♣2♦, awarding Joseph the pot to double up. 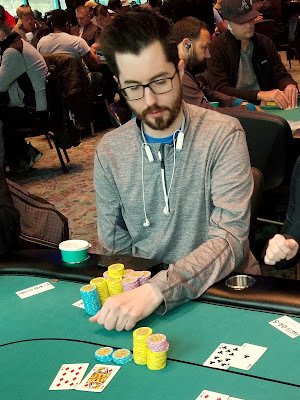 Facing a raise from John Les in the hijack, Robert Jandreau moves all in from the small blind for 64,500. Les calls. The board runs out 10&spades,7♥6♣4♥4♣ for Jandreau to double up. John Ray moves all in from middle position for 47,500, and John Phan moves all in over the top from the cutoff. All other players fold. The flop comes Q♥Q♠7♠ leaving Phan in the lead with his pair of tens, but the A♠ on the turn gives Ray a higher two pair to take the lead. "Ahhh man," the small blind says, "I folded ace-queen, but I couldnt call two shoves with it." "Spades," someone points out, referring to Phan holding the only spade for the flush draw. But it's the J♣ on the river, and Ray doubles up. There are now 109 players remaining, and 108 of them will make the money, which means we have reached the hand-for-hand portion of play. Play will resume at hand-for-hand until the field is thinned by at least one player. When 108 remain, all remaining players will be officially in the money, and guaranteed at least $749, with the eventual winner of the tournament taking home $57,590. Get it all In with J/10 vs A5 on a 10/5/4 flop. It appears to be a 4-way limped pot pre-flop, and the board reads 10♦6♣4♣. The blinds both check, Jonathan Stakley bets 25,000 in middle position, and Zhi Guo moves all in from the hijack. It folds back to Stakley who quickly moves his 84,000 in remaining chips forward to call. 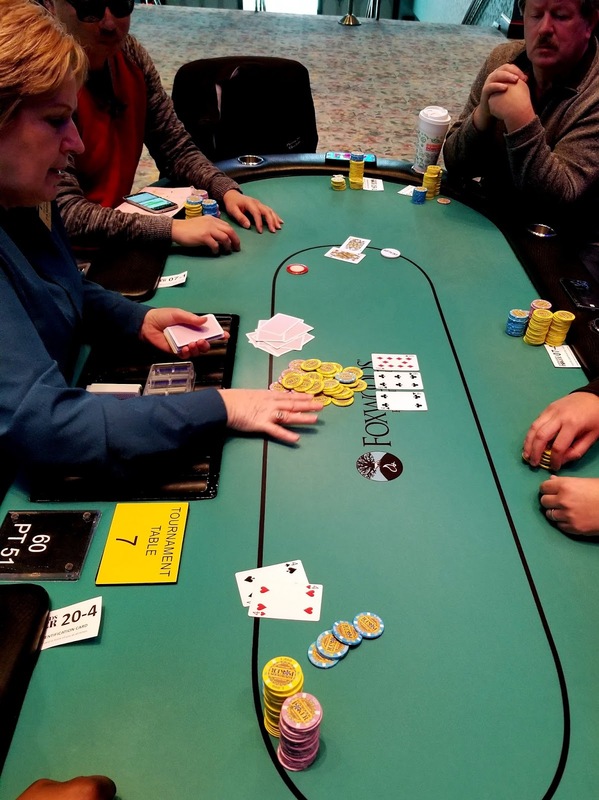 The A♠ turn is safe for Stakley, and the A♣ river gives him a full house to double up. Susan Mariano limps in from under the gun, and it folds around to Thomas Penza who checks his option in the big blind. The flop comes 6♦5♦4♥. Penza checks, and Mariano moves all in for 76,000. Penza goes into the tank, thinking for nearly two full minutes, counting out the chips to call, and then counting out his chips behind, and then announces that he calls. The J♠ turn is safe for Mariano, but the river is the J♦. "Whew, I needed that," Mariano says. But Penza quickly replies, "I have the diamonds, I hit the flush." "Oh shoot, I didnt even see that," Mariano says as she slowly stands up and prepares to exit the tournament area. "I think I had to call there," Penza says after Mariano departs the table, "I had 15 outs twice." 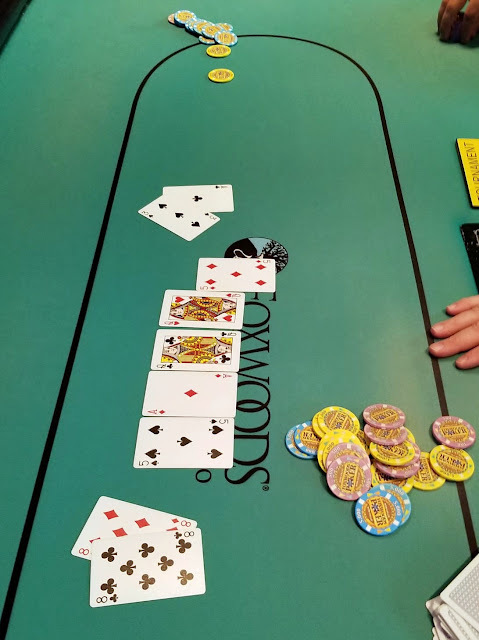 The flop comes J♥10♣8♦, leaving Kachittavong's pair of kings in the lead, but giving Sandberg a gutshot broadway straight draw. The Q♣ turn brings the broadway straight for Sandberg to take the lead. The 3♥ comes on the river, and Sandberg doubles up.